Welcome to another recap from our 2017 Princess Half Marathon weekend! Today, I'm sharing all about my experience with the Enchanted 10K! 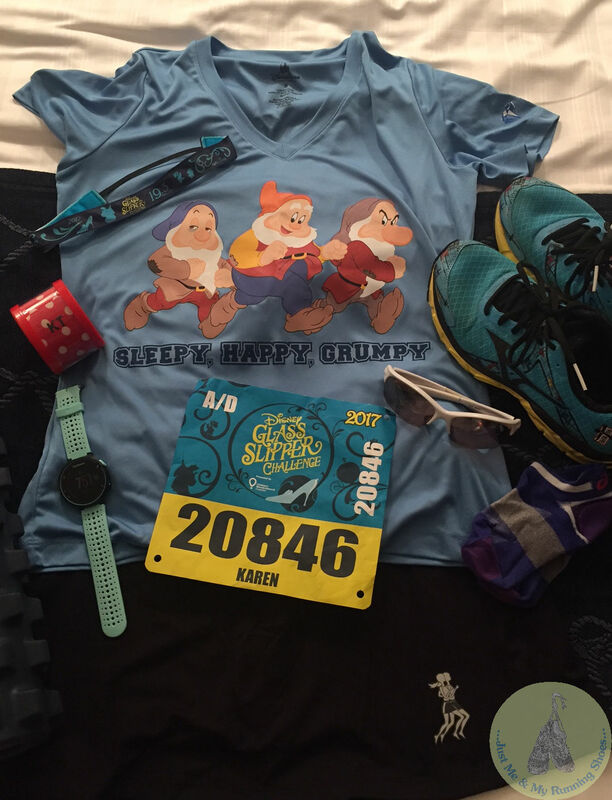 For starters, I've had SO many questions about Brayden and who watched him the morning of the 10K. Well, I used Kids Nite Out and loved my experience with them - I can't wait to share all about that in an upcoming blog post! So, race morning came bright and early as per usual with runDisney events. Promptly at 3:30 a.m., a knock came to my door from a Kids Nite Out sitter named Maria. After a brief rundown of Brayden's routine, we said goodbye and were on our way to the buses! I was so excited for my husband and his first ever 10K! 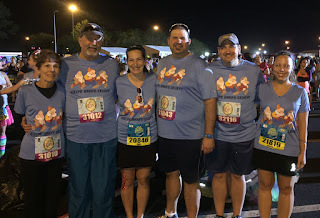 My parent's were participating in their first ever 10K, too! 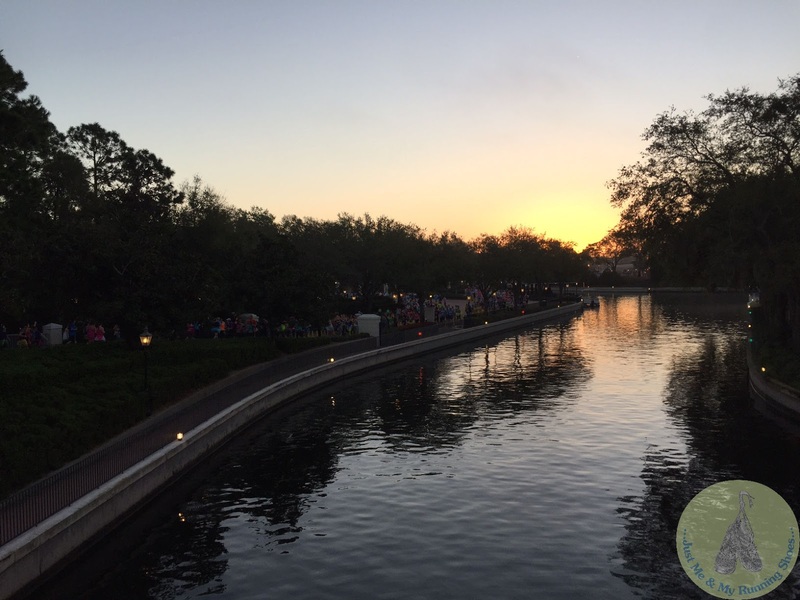 The bus ride to the Epcot parking lot was fast and we arrived in no time! Thankfully, we didn't have any bags and were able to walk right on through. It wasn't long before we found the rest of our crew for a picture! 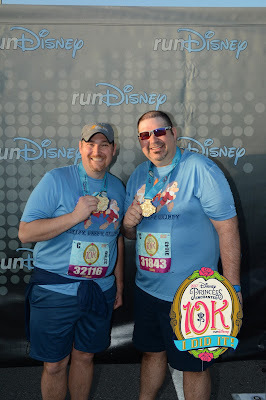 At first, we were each going to be one of the 7 Dwarfs (6 in our case), but that became a little too complicated, so we went with these shirts from the WDW January Marathon Expo! ...and the back said, "and that's just the first three miles"! We hung around the family reunion area for a little while before heading to the corrals. 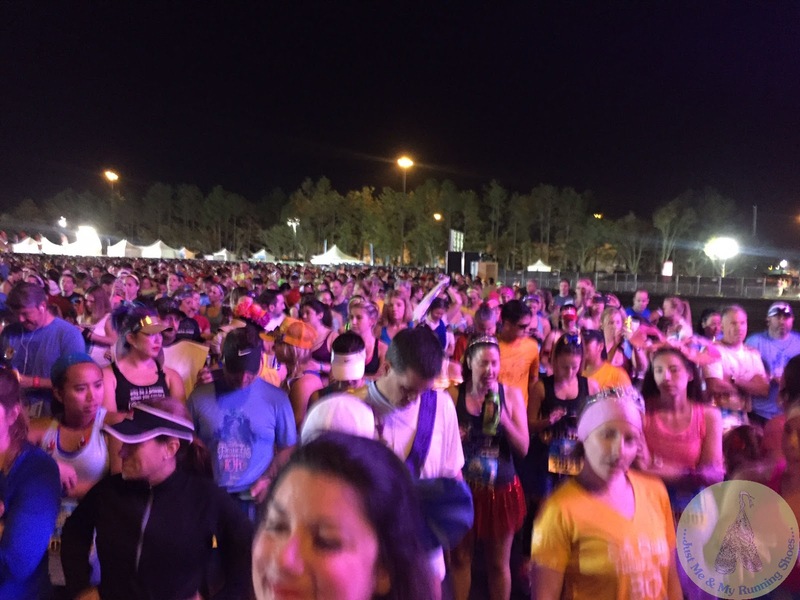 A huge plus of the 10K is the close proximity of the corrals! I somehow landed corral A! 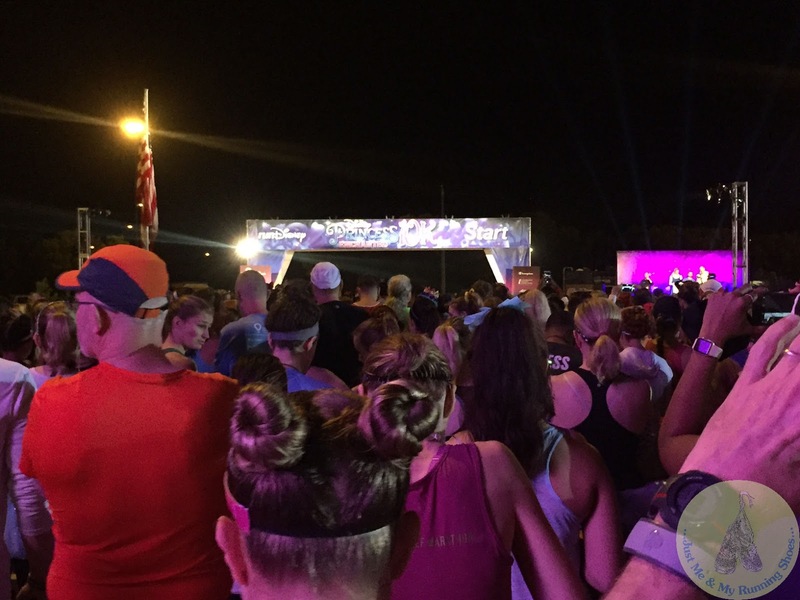 After joining in the crowd, I realized I was also fairly close to the start line. Something I heard that runDisney started doing in January was separating the 10K corrals. 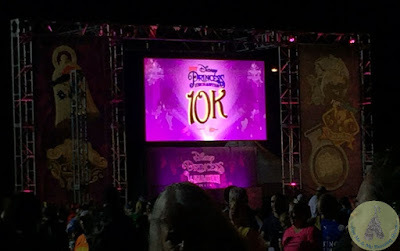 I'm not sure if they did it for other events, but they definitely separated the 10K corrals into even smaller sections here for Princess weekend, too. We watched a video from Children's Miracle Network which definitely brought a tear to my eye as it was all about a little girl who was diagnosed with cancer. It also hit close to home as my hospital is a CMN hospital! SO many runners behind me! Even with my close proximity to the start line, I still managed to get stopped by the runDisney tape. However, I was in the very front of the second group from corral A. After a fireworks start, we were off! 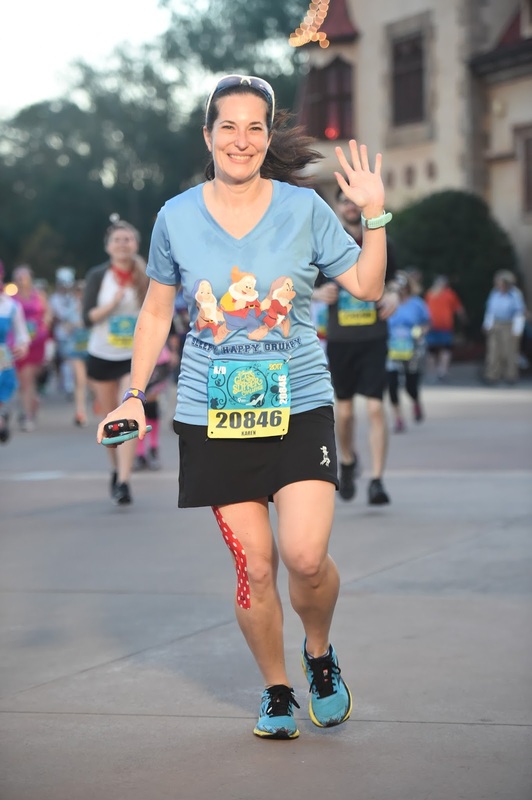 Very early on in the race (around the first half mile), we spotted Moana at the overpass. I've seen Anna and Elsa here in the past, so it was nice to see a new character there! As we rounded up the highway towards the first character stop, we saw the lead runners not too far away and it felt pretty cool to be in the front of such a huge event! Even so, I was incredibly surprised at the line of runners for the first character stop. It was Elena of Avalor and I just had to stop for my best friends nieces! They LOVE Elena. The super long line slowed me down and became a precedence for the remainder of the race. 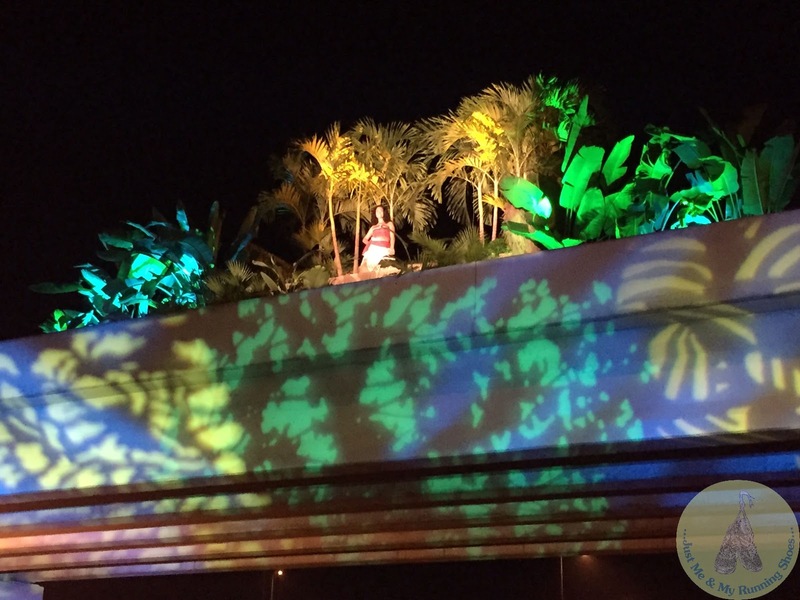 The next stop was with Tink, followed by the Snow Queen! I just HAD to stop for her! I've never seen her out for a race so this was really exciting for me! 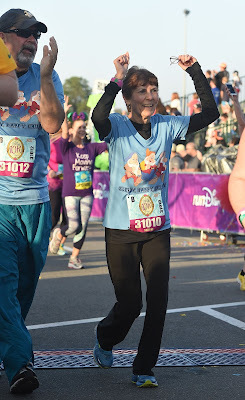 As we approached Epcot and the 3 mile mark, I spotted my husband and his friend who were walking the race and started in corral C.
They asked if I was lapping them because they thought I would be long gone by that point. After talking about the crazy lines, I continued on my run. 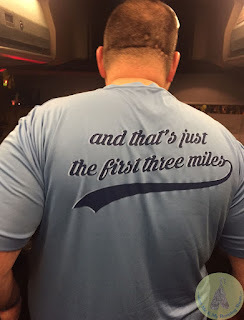 Almost immediately, I received a notification that I crossed the 5K mark and my parents were only about 30 seconds behind me. They were also walking this race, so I stopped along the side to see if I could find them. While standing there, Kristen spotted me and said a quick hello! It was fun to see a familiar face in the sea of runners! It didn't take long before I found my parents. They were staying to the right like I instructed them to do (good job)! They also asked if I finished the race, where was my medal, and was I running a second time?! 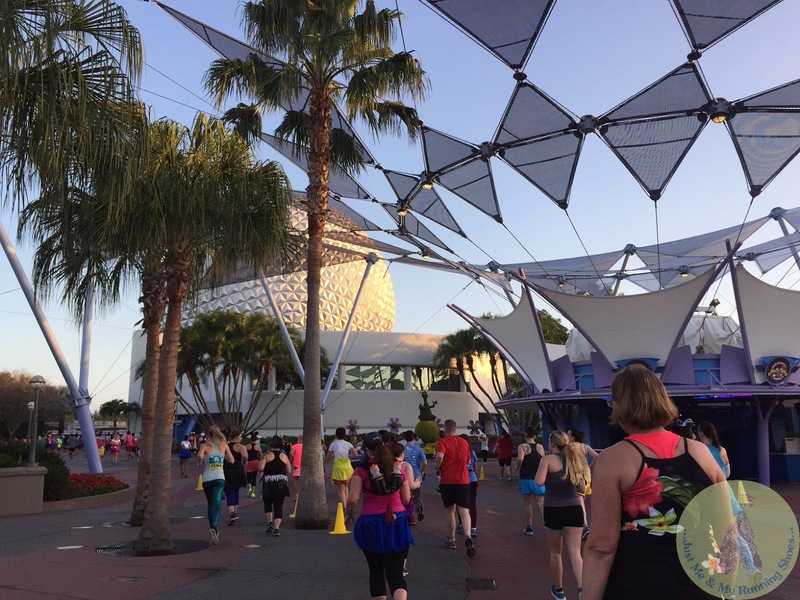 After arriving in Epcot, I grabbed a cup of water and continued on my run. That's when I saw Dopey. I've never ever ever been able to snag a picture with him and I hoped that day would be my lucky day. 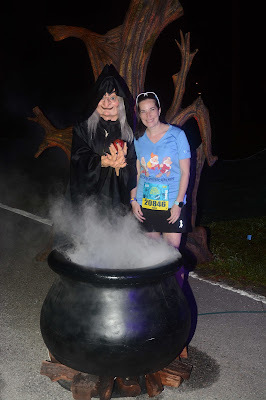 Besides, I booked his race for January, I just had to say hello, right? 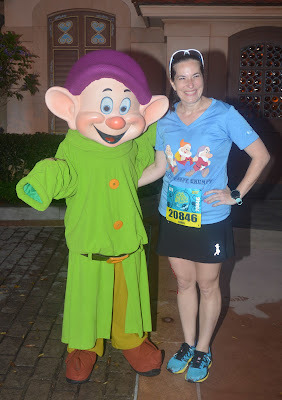 Well, in true Disney fashion, the line for Dopey weaved in an out (via tape markers on the ground), but I finally made it to him! He wanted to know why he wasn't on my shirt! 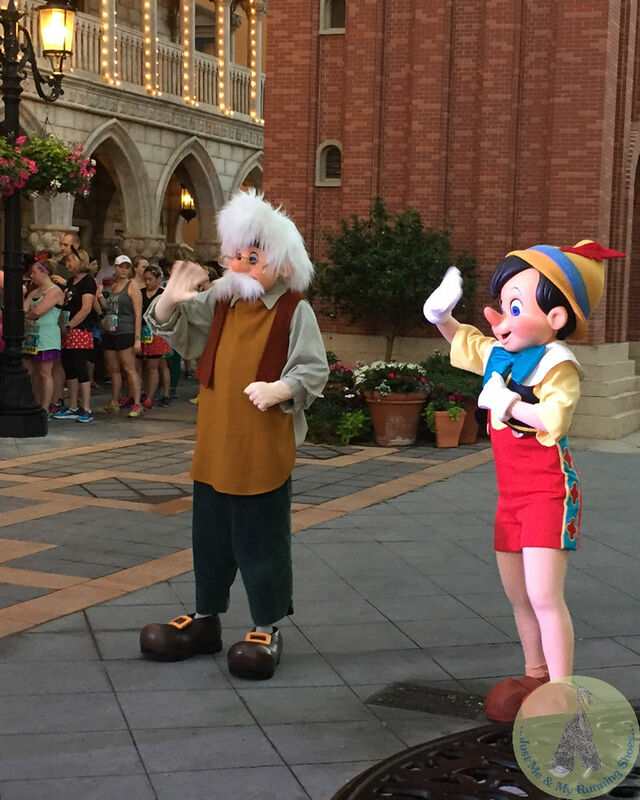 Whoops...sorry, Dopey! 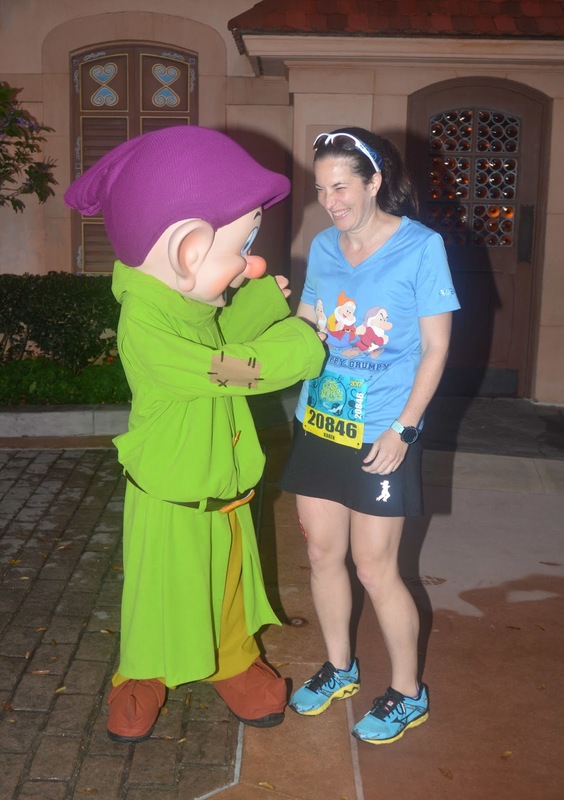 Thanks, Dopey! See you in January! At this point, I made the executive decision to stop only for characters I'd never taken pictures with in the past. 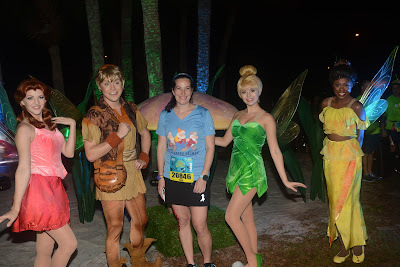 This was also my first experience with the Disney Photo Pass photographers at runDisney events! They did an amazing job!! By the time we left Epcot, the sun was starting to rise! 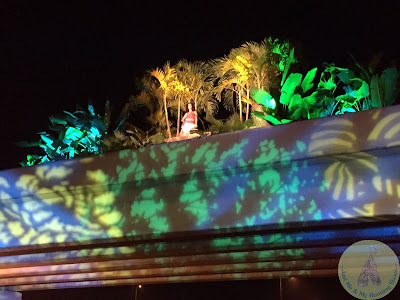 The course looped around to the Boardwalk, Yacht, and Beach Club resorts before leading us back into Epcot. Epcot was gearing up for the Flower and Garden Festival and I couldn't wait to see it later in the week! 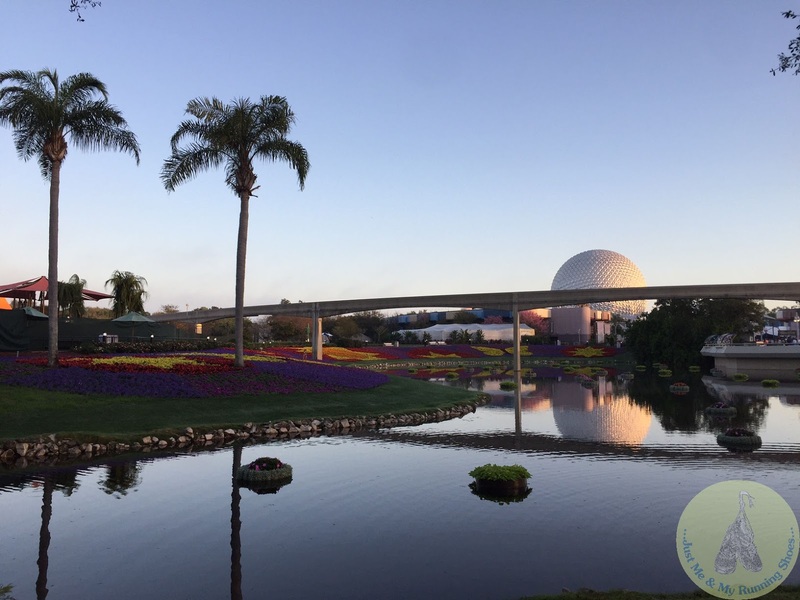 Epcot is truly one of my favorite parks! Before I knew it, I was at Mile 6 and almost finished with the race! 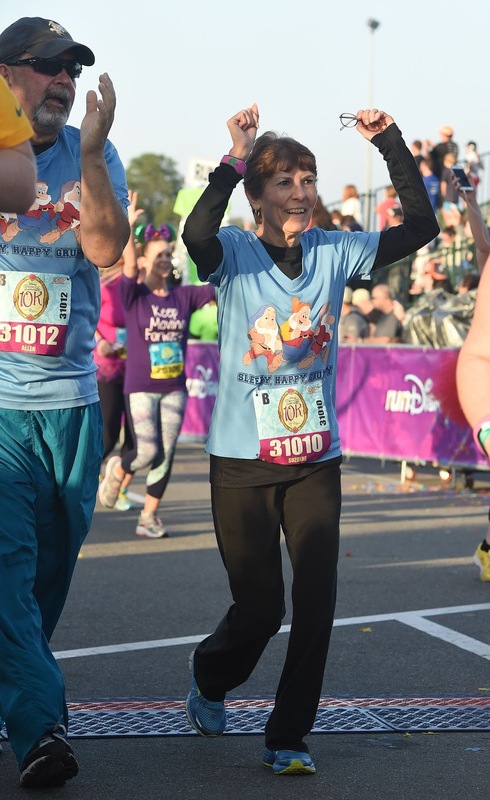 My friend Melissa had crossed the finish line at this point but my parents and husband had not - I knew they weren't far behind! Yay finish! 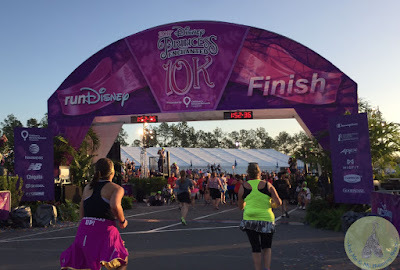 The first part of my two part race weekend was complete! Ok - I have a question....? 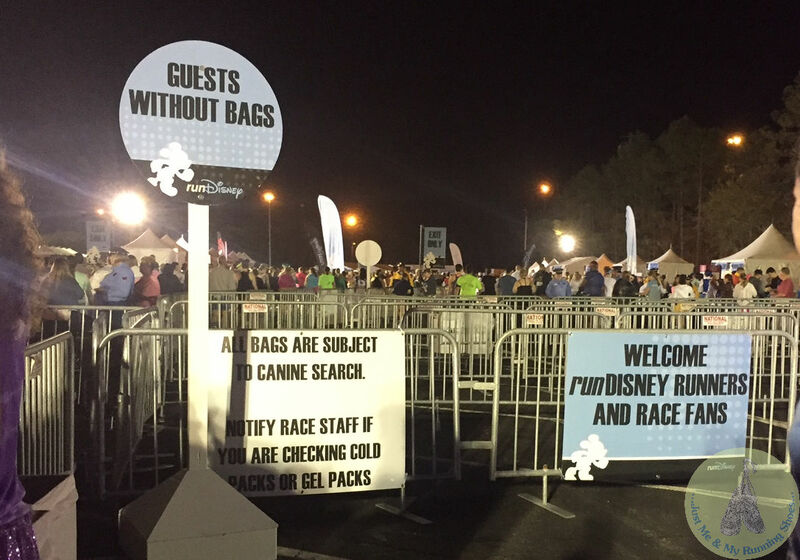 I see that the backdrops for this race weekend were generic to runDisney. Was this a recent change? In the past, the backdrops have been tailored to each specific race. Anyone know? 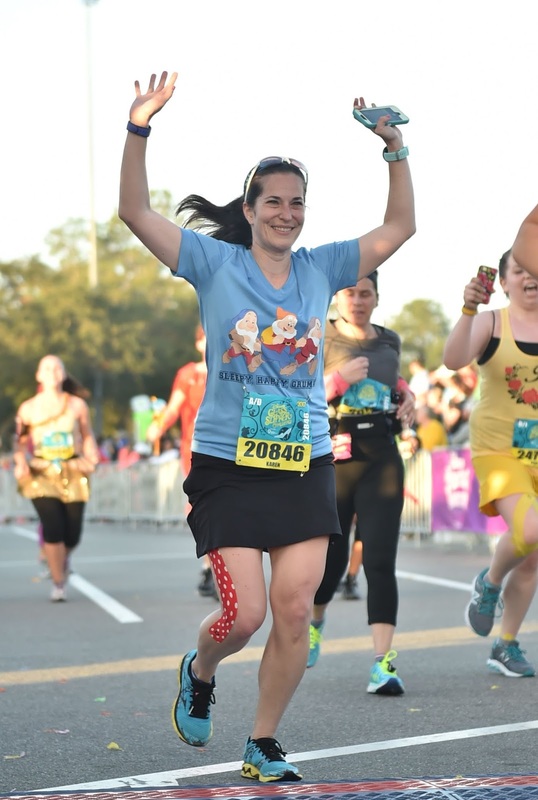 I do see that they've added little race specific overlays the bottom of the pictures...maybe this is their new way of doing things? After the picture, I grabbed a food box and a banana, then wandered out of the finish area to wait on my family. 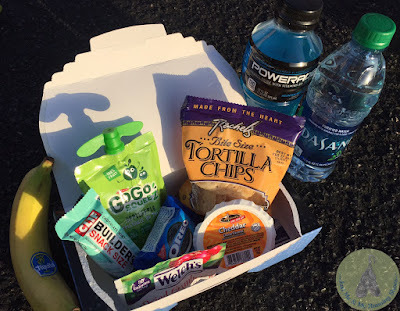 As usual, the food box was filled with all kinds of yummy goodies! 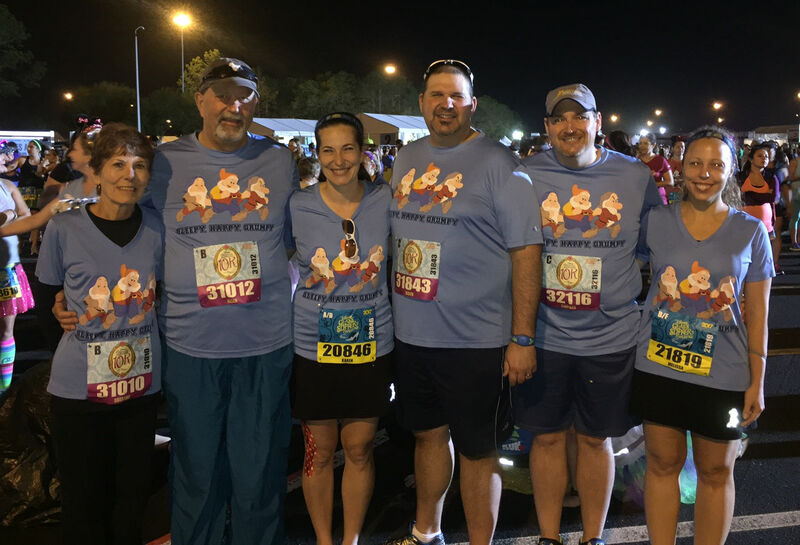 My husband and parents crossed the finish line to successfully complete their first 10K! I couldn't have been more proud!! 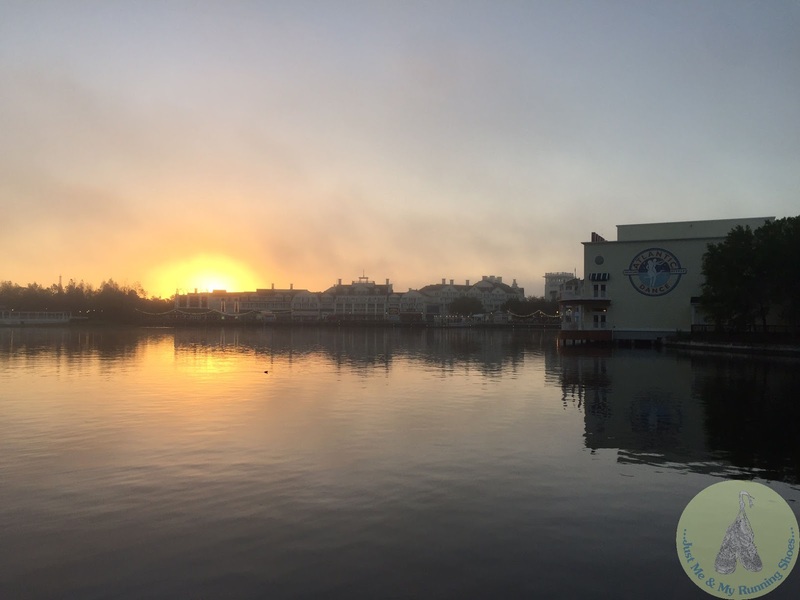 After eating some goodies and reuniting with our goofball friends, we decided to call it a morning and head back to our resort. I relieved the Kids Nite Out sitter (she was seriously too wonderful for words) then after a quick shower, Brayden and I walked over to the Boardwalk Bakery breakfast. We really enjoyed sitting out on the Boardwalk, enjoying the beautiful weather, and saying hello to the ducks! 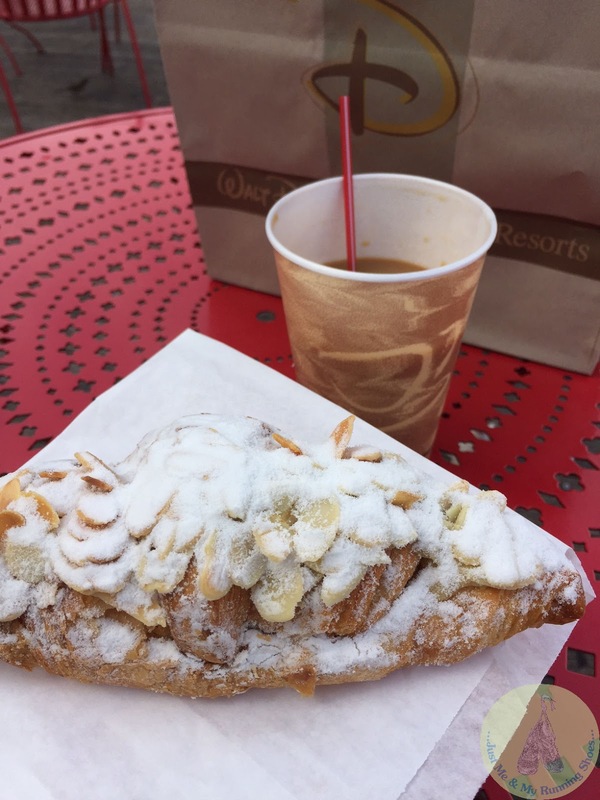 My pastry wasn't too bad either! Yum yum! 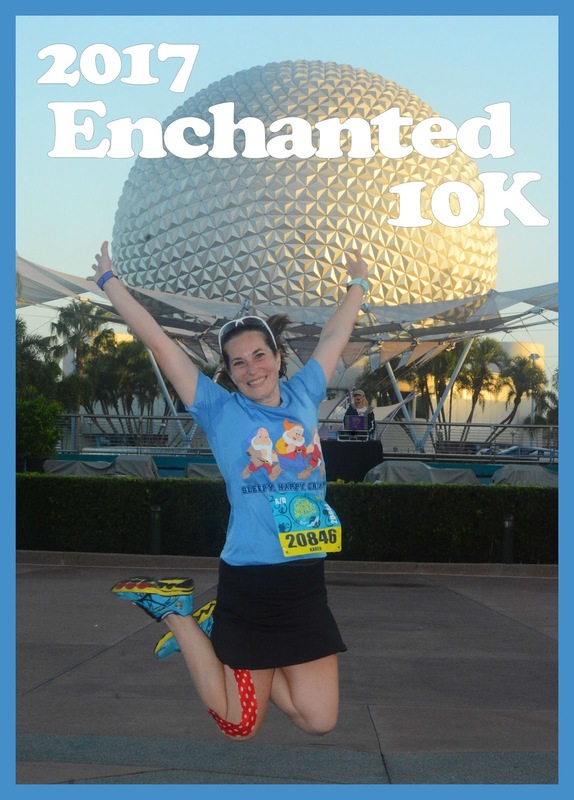 So that's it for my recap of the Enchanted 10K. 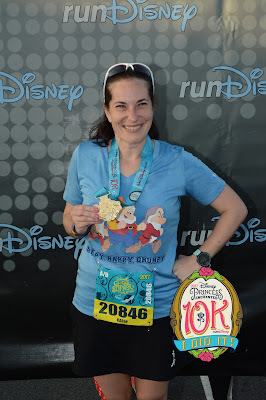 Despite the crowded course, I really love this route and had a great time running this race! 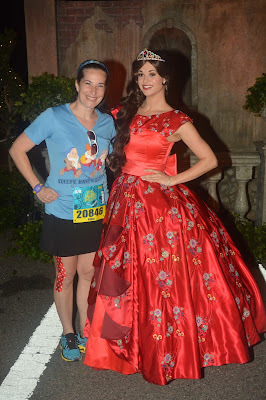 Stay tuned for more from our Princess Half Marathon Weekend as well as my YouTube channel for video recaps! 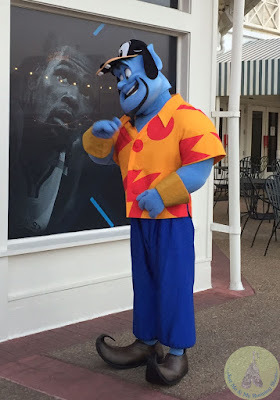 I'd love running around the Boardwalk area. I have run the lake a few times when I was training in college, so it would feel like "home" to me. You never know how big that lake is until you run it. 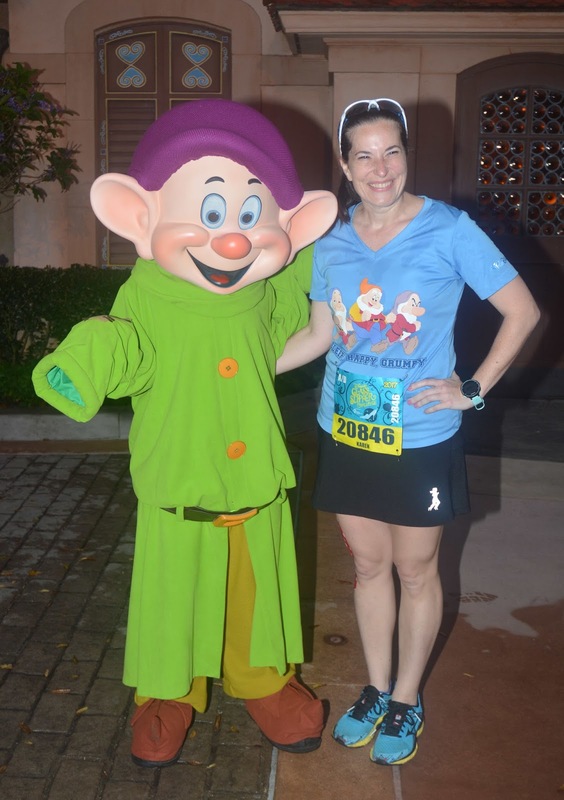 How fun that you were able to stop for characters and still met up with your family on the course. This is seriously the most characters I've seen on the 10K course! 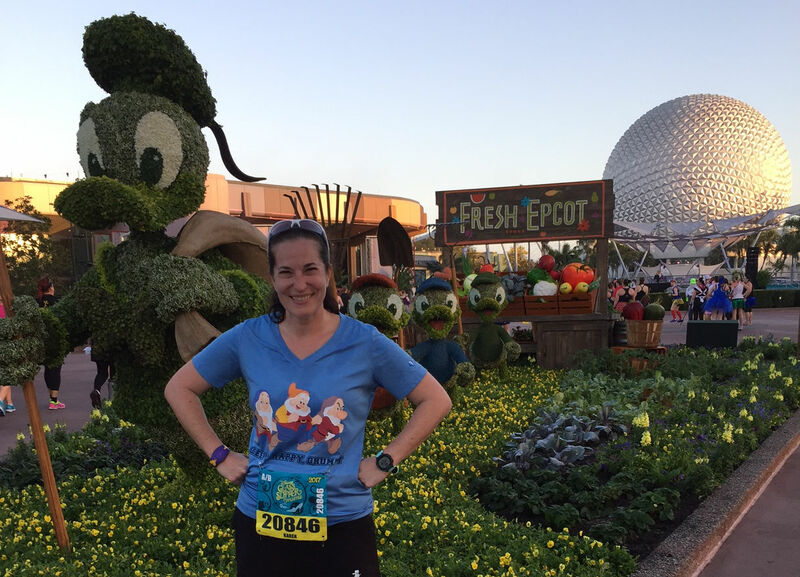 Perhaps since Disney switched to photo pass instead of Marathon photo they are using new backdrops. Perhaps marathon photo was the one in charge of the backdrops in the past? Thanks for the recap! 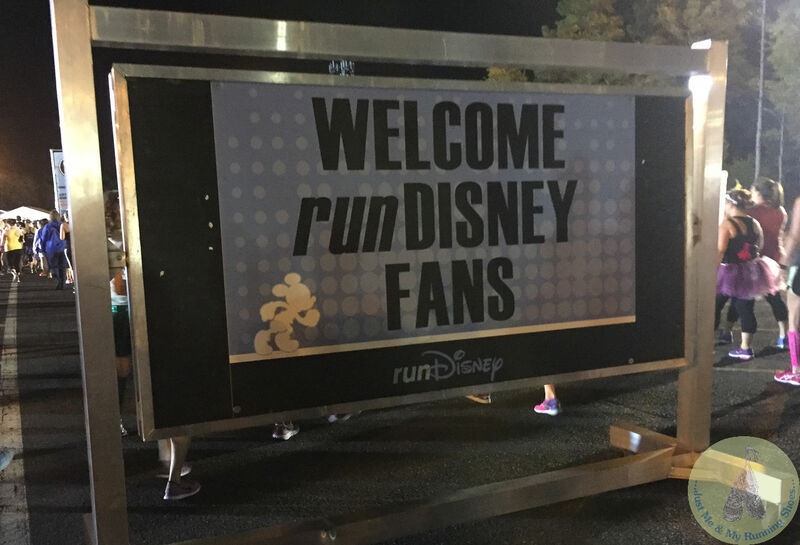 I found you on a #rundisney feed. Running my the Darkside half as my first ever rundisney race and it was great to see a little of what to expect. 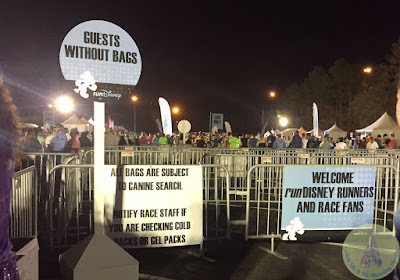 Since they have been using the Disney Photo Pass the background change has been happening at the races I have been to. Sort of like them adding Tink to your picture in Epcot. Saves them money on backgrounds. 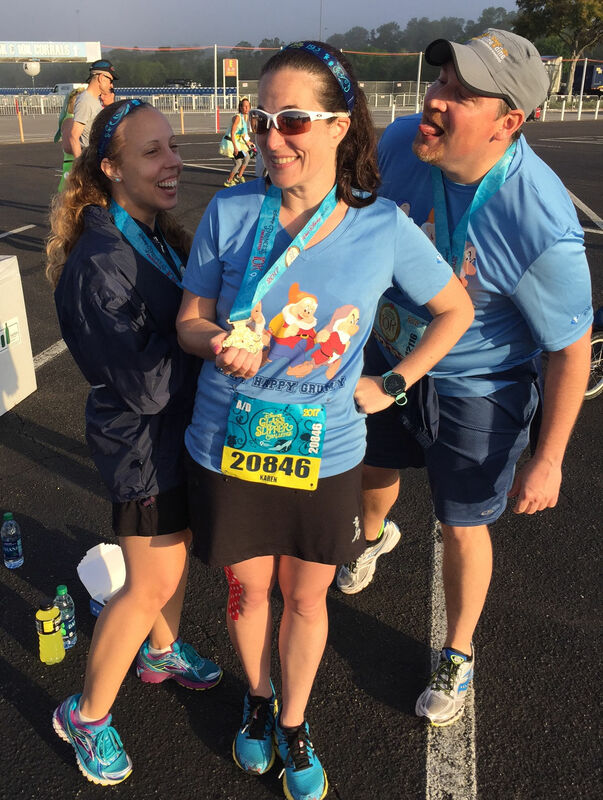 And congrats to your husband and parents for their first 10k. A fun one to start with!